Every year at Porcfest we seem to grow. This year we actually spilled over into a second vending site. On one site we had the Metalith, a vending machine equipped to receive and dispense bitcoin. On the second site we had the Voting Machine, a retrofitted slot machine intended as performance art to demonstrate that voting is gambling. The Metalith was a site to see, especially at night. The machine rested in a clearing on the top of a small hill, like the obelisk from 2001: A Space Odyssey, and the lights inside shined in the dark from a great distance. The slogan on the side of the machine was “Sell all the things, for all the money” and inside you could find familiar items like Milk Duds, but you could also find unusual items like bullets and drug tests. But most importantly it was a proof of concept. 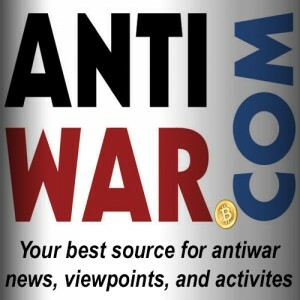 Bitcoin being a potentially anonymous currency, and vending machines being a potentially anonymous purchase, the existence of a Bitcoin compatible vending machine means that an anonymous marketplace like Silk Road is physically possible, in some sense, at least in the relatively laissez-faire atmosphere of Porcfest. The Voting Machine was a different animal all together. The guts of the thing were a simple slot machine, but the reels were removed and replaced with fictional candidates, like Megatron and Cthulhu. We charged a 25 cent poll tax, but voters could vote as much as they liked. We warned them that the odds were against them and they probably wouldn’t get what they wanted… just like real voting. I understood conceptually why it was good joke from the beginning, but I didn’t realize how far we could push the metaphor until people started playing. For example, some people won. That certainly happens in a democracy. But the likelihood of winning is carefully calibrated to keep people playing, even though they’ll lose in the long run. That rule goes for voting and gambling as well, but by far the most rewarding sight was seeing scores of anarchists proudly sporting their “I Voted” stickers all week long. The only thing that could have made it better is if the Voting Machine took Bitcoin. Maybe next year. And that was just the main course. The week of PorcFest was also full of many delicious side dishes. We recorded live episodes of the Freedom Feens every night. MK Lords performed in the play “Mozart Was A Red” and won Ms. Hot Box (formerly known as Ms. Porcu-Pole) at Buzz’s Big Gay Dance Party. I had the opportunity to perform with Jordan Page at the Artsy Fartsy talent show. 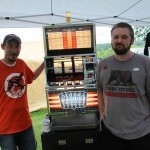 And CNN’s Chris Moody did a feature on PorcFest which focused on both the Metalith and the Voting Machine. We’ve put together quite an efficient crew, and we can only go bigger from here. We want to thank the Free State Project for hosting Porcfest, Derrick Slopey for his tireless programming efforts, and a special thanks to Tim Frey of Roberts & Roberts Brokerage for his very generous support in making these stunts happen. 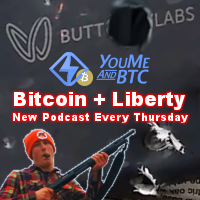 What a “Grexit” Could Mean for Bitcoin LBRY Sneak Peek: Can Blockchain Tech Beat BitTorrent, NetFlix and iTunes?